With the Oakland Athletics moving toward a playoff birth, they have lost arguably their best starting pitcher to injury. The club placed lefty Sean Manaea on the 10-day DL on Sunday with a shoulder impingement. Even if Manaea’s time on the DL is brief, the injury comes at a bad time with the A’s locked in a tight race with the Astros atop the AL West. 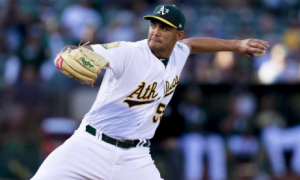 Up until now, Manaea had been the one constant in Oakland’s rotation this season. The A’s have already used 13 different starters. Manaea has made 27 starts, with no one else making more than 16. The A’s have ultimately settled on a rotation largely filled with journeymen. Veterans like Edwin Jackson, Trevor Cahill, and Brett Anderson have been surprisingly effective this year. However, it’s been Manaea leading the way, helping put the A’s in contention for a playoff spot. In his 27 starts, Manaea is 12-9 with a 3.59 ERA. He announced himself as the ace of Oakland’s staff back in April when he threw a no-hitter. The A’s have seen Manaea’s velocity drop over the past couple of months. But that hasn’t stopped him from being an effective pitcher. He’s won three of his last five starts, including five strong innings against the Twins on Friday. Chris Bassitt appears to be in line to take Manaea’s spot in the rotation. Bassitt was brought up to start Sunday against the Twins in an effort to give Oakland’s veterans an extra day off. After a decent start against Minnesota, he figures to stick around for at least another start or two while the club waits for Manaea to come off the DL. However, losing Manaea was certainly not in the team’s plans. At the moment, the A’s are a game behind the Astros in the AL West and hold a comfortable lead over the Mariners for the second wild-card spot. However, there’s plenty of time for that to change if the A’s start to struggle. If Oakland is lucky, Manaea will only miss a start or two. But shoulder problems for the team’s best starter at this time of year have to be of great concern. Losing Manaea for an extended period of time would be a big blow to Oakland’s playoff hopes. Right now, the A’s just have to hope for the best, which would be Manaea returning as soon as possible.